The Colormix automatic blender is suitable for homogenisation of dispensed inks in buckets. 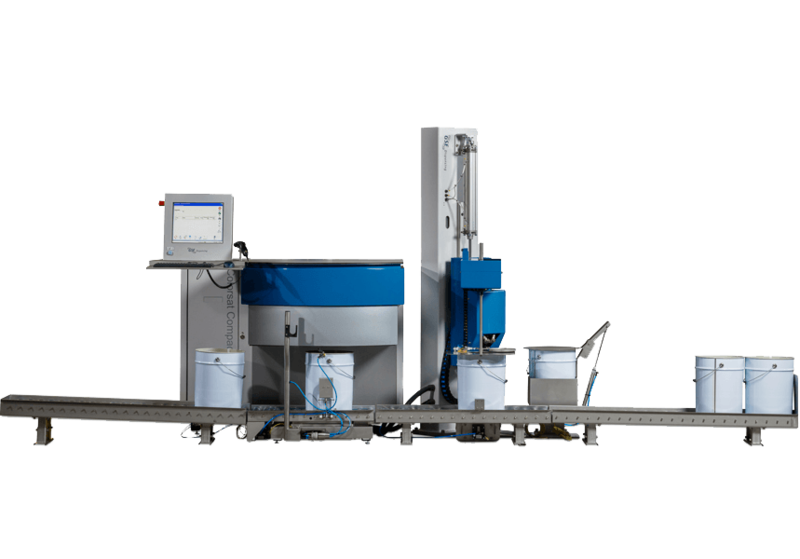 The blender with the automatic conveyor system is integrated with the exit side of roller conveyor of the Colorsat Compact dispensing system (low or high version). The blender is suitable for water-based and solvent-based inks. There are two executions available, depending on the bucket size and ink viscosity. The standard version is suitable for buckets up to 25 liters and a viscosity up to 500 mPas. The “heavy duty” version can handle buckets of up to 60 liters and a viscosity of up to 1,250 mPas. After the bucket with dispensed ink is automatically positioned underneath the blender, the shaft with propeller blades will be lowered inside the bucket. The blending process is started. The duration of the blending cycle is adjustable. After the blending process is ended, the shaft will be raised. Beside the blender a bucket with detergent is positioned for cleaning the shaft and the propeller blades. After each blending, the blender will be turned and lowered inside this bucket with detergent. The cleaning process is started. The duration of the cleaning cycle is adjustable. After the cleaning process is ended, the shaft will be raised and the blender will be turned back. 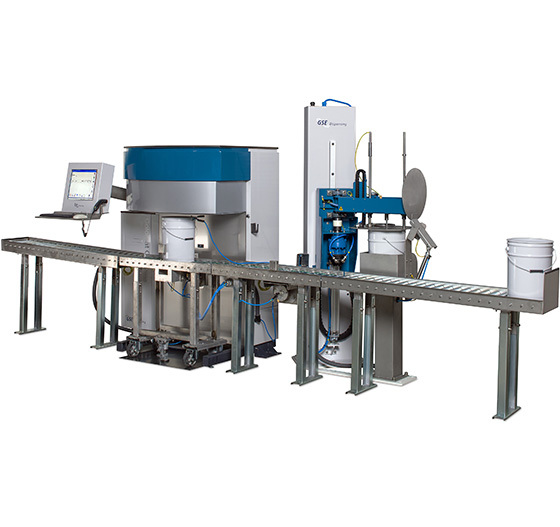 The bucket transport and positioning and the blending and cleaning processes are completely automated and controlled by the software of the dispensing system. All up and down movements of the blending shaft are automatic (by a pneumatic cylinder), and also the rotation of the blender is fully automated. The rotation speed is adjustable with the exhaust of the pneumatic blender motor. 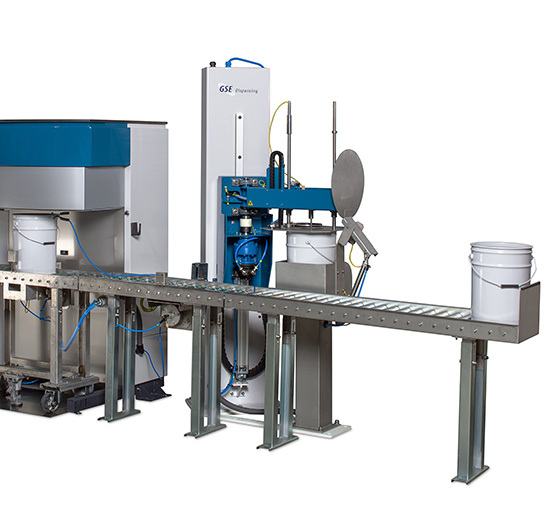 The automatic blender can be integrated with a Compact High dispensing system. 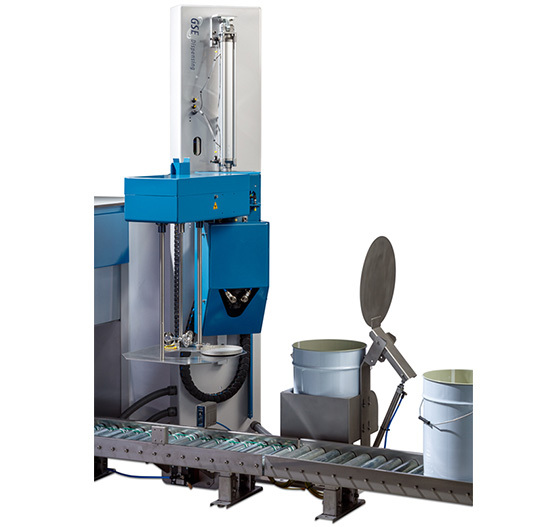 An automatic bucket transport system (roller conveyor) will enable you to dispense into buckets, and to make small batches. It consists of an entry conveyor and an exit conveyor. In between, underneath the dispensing station (above the floor scale), there is an opening, which makes it possible to position an open-top drum, and dispense into this drum. 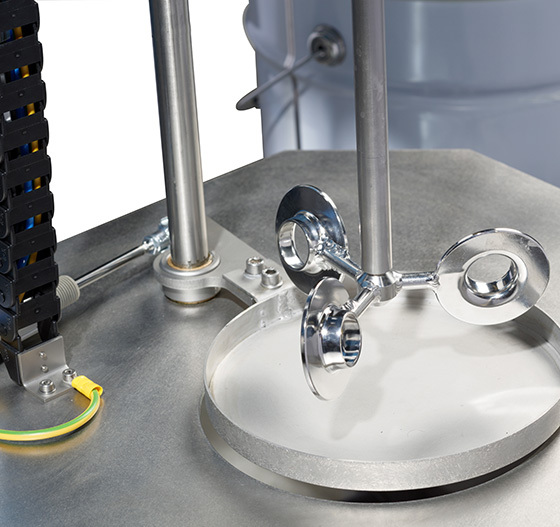 For dispensing into buckets or pails, a mobile conveyor (cart) can be positioned on this floor scale. This mobile conveyor bridges the entry and exit conveyors.